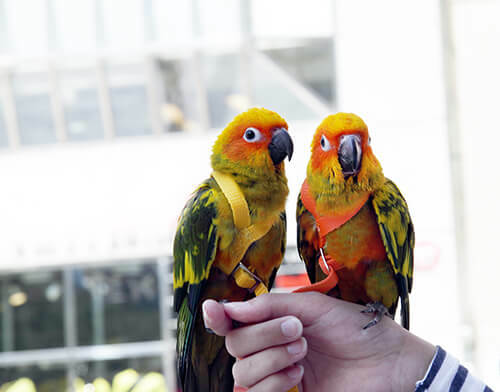 Parrot harness training – is a very rewarding activity, for both the parrot and their guardian human and will allow you to build a special bond with your feathered friend during the process. You’ve seen by now the videos of Parrots sitting patiently on perches, obeying commands, and you find yourself questioning how a bird can be so well behaved. Training of course, but also incorporating a harness is most definitely a great way to encourage good behaviour and build a bond with your Parrot throughout the process. As owners, we may get frustrated with our Parrots not doing what we want, when we want. But, we often overlook that such behaviours aren’t so easily established. It will take time and devotion and is not instantaneous or as easy as training other domestic animals. Knowing that such behaviours will take time, sets you up to be successful and eventually, you’ll find the sort of training methods and techniques your bird requires to learn such traits. Different Parrots work well with different harnesses, there is no “one size fits all” type of solution for your Parrot. You may find that one Parrot is responding better than your other parrot in training, don’t be discouraged. When it comes to a Parrot harness training, Barbara Heidenreich, a professional animal trainer, stresses the importance of patience. “I often tell people what if this was a lion or a porcupine….what would you do if that animal did not want to go in the harness? Force will likely cause aggressive behaviour or an animal that won’t come near you,” she says. The main goal with positive reinforcement is to create an eager participant and the rest, like a special bond and one-to-one time with your Parrot, follows suit. At the end of the day, know that difficult behaviours may be harder to break and require more attention, practicing patience and understanding, and training when your Parrot is most responsive, time and pace wise, is crucial to teaching your Parrot with a harness. Be patient. You have many years ahead of you with your Parrot. We suggest Aviator Harnesses, try them out today! Check out Barbara’s training videos here at Parrot Essentials.